Download "RECOMMENDATION LDD MONITORING FORM REQUIRED"
1 RECOMMENDATION LDD MONITORING FORM REQUIRED This document shows the case officer's recommended decision for the application referred to below. This document is not a decision notice for this application. Applicant Bower Trading Ltd Reg. Number 10-AP-2796 Application Type Full Planning Permission Recommendation Grant permission Case Number TP/ Draft of Decision Notice Planning Permission was GRANTED for the following development: Construction of four storied building, plus basement, comprising 330m2 of A1 / A3 use at basement and ground floor, with 9 self contained residential units located at first, second and third floor levels (comprising 1x studio, 6 x one bed and 2 x two bed units); with cycle and refuse storage at ground floor and hard and soft landscaping. At: 292 WALWORTH ROAD, LONDON, SE17 2TE In accordance with application received on 24/09/2010 and Applicant's Drawing Nos F ; 0291 F ; 0291 F ; 0291 D ; 0291 D ; 0291 D ; 0291 D ; 0291 D ; 0291 D ; 0291 D ; 0291 D ; 0291 D ; 0291 D ; 0291 D ; 0291 D ; 0291 D ; 0291 D ; 0291 D Air Quality Assessment, Code for Sustainable Homes - Level 3, Design and Access Statement, Flood Risk Assessment Report, Environmental Noise Survey and PPG24 Assessment Report 3690/PPG, Planning Support Statement, Renewable Energy Report and Transport Planning Practice. Subject to the following condition: 1 The development hereby permitted shall be begun before the end of three years from the date of this permission. As required by Section 91 of the Town and Country Planning Act 1990 as amended 2 The development hereby permitted shall not be carried out otherwise than in accordance with the following approved plans: 0291 D ; 0291 D ; 0291 D ; 0291 D ; 0291 D ; 0291 D ; 0291 D ; 0291 D ; 0291 D ; 0291 D ; 0291 D ; 0291 D ; 0291 D ; 0291 D ; 0291 D For the avoidance of doubt and in the interests of proper planning. 3 Samples of all facing materials to be used in the carrying out of this permission shall be submitted to and approved by the Local Planning Authority before any work in connection with this permission is carried out and the development shall not be carried out otherwise than in accordance with any such approval given. 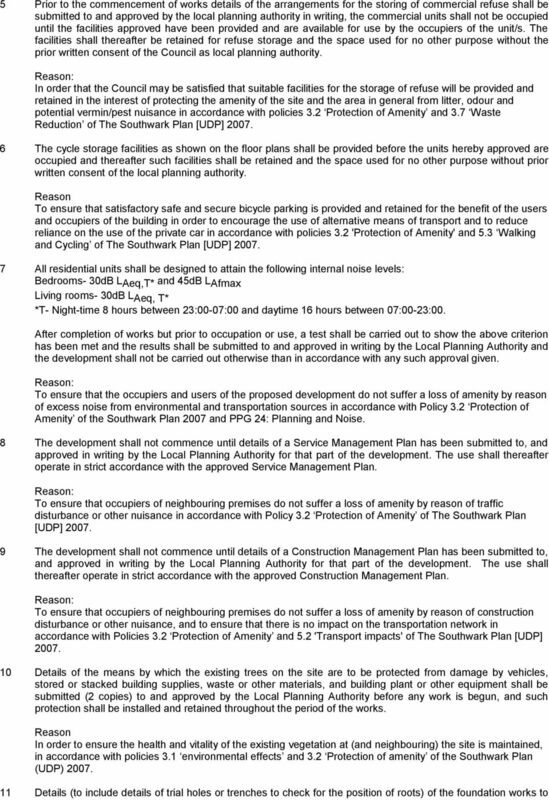 In order that the Local Planning Authority may be satisfied as to the details of the facing materials in the interest of the appearance of the building in accordance with Policies 3.12 'Quality in design' of The Southwark Plan [UDP] Prior to the commencement of works details of the arrangements for the storing of domestic refuse shall be submitted to and approved by the local planning authority in writing, the residential units shall not be occupied until the facilities approved have been provided and are available for use by the occupiers of the dwellings. The facilities shall thereafter be retained for refuse storage and the space used for no other purpose without the prior written consent of the Council as local planning authority. In order that the Council may be satisfied that suitable facilities for the storage of refuse will be provided and retained in the interest of protecting the amenity of the site and the area in general from litter, odour and potential vermin/pest nuisance in accordance with policies 3.2 Protection of Amenity and 3.7 Waste Reduction of The Southwark Plan [UDP] 2007. 3 be used in the construction of this development showing how the roots of the trees will be protected shall be submitted (2 copies) to and approved by the Local Planning Authority before any work in connection with this permission is carried out. The use shall thereafter operate in strict accordance with the approved details. In order to ensure the health and vitality of the existing vegetation at (and neighbouring) the site is maintained, in accordance with policies 3.1 environmental effects and 3.2 Protection of amenity of the Southwark Plan (UDP) Detailed drawings of a landscaping scheme, including provision for the planting of suitable trees and shrubs, showing the treatment of all parts of the site not covered by buildings (including surfacing materials of any parking, access, or pathways) shall be submitted to and approved by the local planning authority before the development hereby permitted is begun and the landscaping scheme approved shall thereafter be carried out in the first appropriate planting season following completion of the building works. 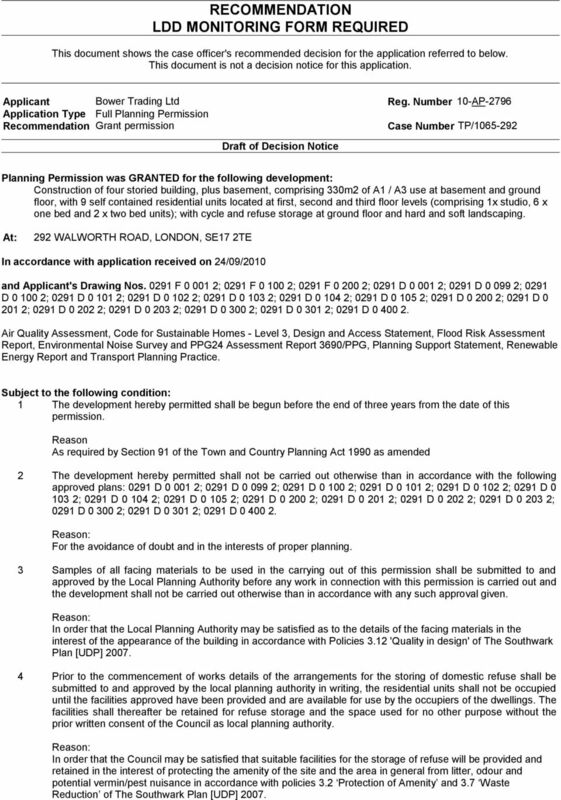 In order to ensure that the proposed development would provide a reasonable standard of amenity for future and neighbouring occupiers in accordance with policies 3.1 Environmental effects and 3.2 Protection of amenity of the Southwark Plan Prior to the commencement of works, details of the means of enclosure for all site boundaries shall be submitted to and approved in writing by the local planning authority and the development shall not be carried out otherwise than in accordance with any approval given. The development hereby permitted shall not be occupied until the works approved pursuant to this condition have been carried out. To ensure that the replacement boundary walls will respect the character and appearance of the streetscene in accordance with policies 3.12 Quality in design and 3.13 Urban design of The Southwark Plan No development shall take place within the proposed development site until the applicant, or their agents or their successors in title, has secured the implementation of a programme of archaeological evaluation works in accordance with a written scheme of investigation, which has been submitted to the local planning authority and approved in writing. To ensure that the archaeological operations (programme of archaeological evaluation works) are undertaken to an appropriate standard, that the archaeological interests of the site are appropriately managed, that any findings are appropriately disseminated, that any recovered artefacts are conserved and that the information is archived. 15 No development shall take place within the proposed development site until the applicant, or their agents or their successors in title, has secured the implementation of a programme of archaeological mitigation works in accordance with a written scheme of investigation, which has been submitted to the local planning authority and approved in writing. To ensure that the archaeological operations (programme of archaeological mitigation works) are undertaken to an appropriate standard, that the archaeological interests of the site are appropriately managed, that any findings are appropriately disseminated, that any recovered artefacts are conserved and that the information is archived. 16 Within six months of the completion of archaeological site works the applicants will supply an assessment report detailing the proposals for post-excavation works, publication of the site and preparation of the archive and this document has been submitted to the local planning authority and approved in writing. To ensure that any findings are appropriately disseminated, that any recovered artefacts are conserved and that the information is archived and the project is published in a suitable way. This will be demonstrated by the production of a document following the guidance of Management of Archaeological Projects II (MAP II assessment report). 17 The development shall only proceed in strict accordance with the approved Flood Risk Assessment (FRA). To ensure the safety of future occupiers in accordance with Planning Policy Statement (PPS) 25: 'Development and Food Risk' 2006. 4 18 No roof plant, equipment or other structures, other than as shown on the plans hereby approved or approved pursuant to a condition of this permission, shall be placed on the roof or be permitted to project above the roofline of any part of the building[s] as shown on elevational drawings or shall be permitted to extend outside of the roof plant enclosure of any building hereby permitted without the prior written consent of the Local Planning Authority. In order to ensure that no additional plant etc. is placed on the roof of the building in the interest of the appearance and design of the building and the visual amenity of the area in accordance with Policies 3.2 Protection of Amenity, 3.12 Quality in Design and 3.13 Urban Design ' of the Southwark Plan [UDP] s for granting planning permission. 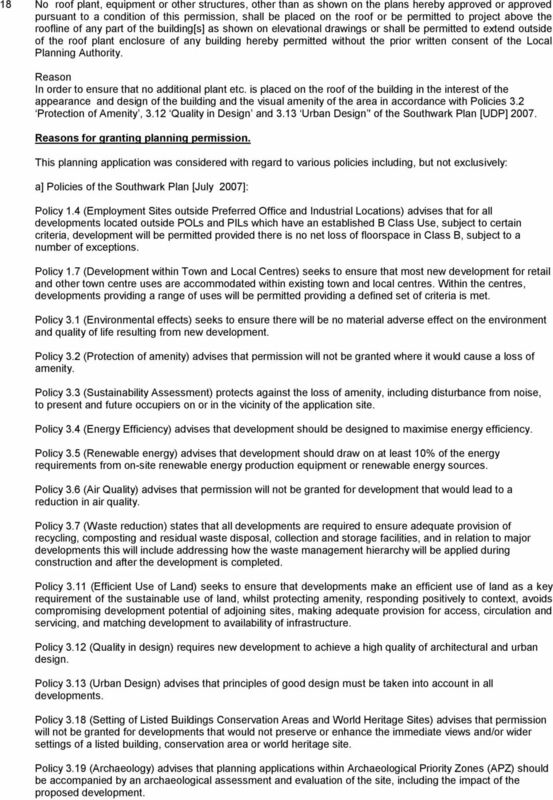 This planning application was considered with regard to various policies including, but not exclusively: a] Policies of the Southwark Plan [July 2007]: Policy 1.4 (Employment Sites outside Preferred Office and Industrial Locations) advises that for all developments located outside POLs and PILs which have an established B Class Use, subject to certain criteria, development will be permitted provided there is no net loss of floorspace in Class B, subject to a number of exceptions. Policy 1.7 (Development within Town and Local Centres) seeks to ensure that most new development for retail and other town centre uses are accommodated within existing town and local centres. Within the centres, developments providing a range of uses will be permitted providing a defined set of criteria is met. Policy 3.1 (Environmental effects) seeks to ensure there will be no material adverse effect on the environment and quality of life resulting from new development. Policy 3.2 (Protection of amenity) advises that permission will not be granted where it would cause a loss of amenity. Policy 3.3 (Sustainability Assessment) protects against the loss of amenity, including disturbance from noise, to present and future occupiers on or in the vicinity of the application site. Policy 3.4 (Energy Efficiency) advises that development should be designed to maximise energy efficiency. Policy 3.5 (Renewable energy) advises that development should draw on at least 10% of the energy requirements from on-site renewable energy production equipment or renewable energy sources. Policy 3.6 (Air Quality) advises that permission will not be granted for development that would lead to a reduction in air quality. Policy 3.7 (Waste reduction) states that all developments are required to ensure adequate provision of recycling, composting and residual waste disposal, collection and storage facilities, and in relation to major developments this will include addressing how the waste management hierarchy will be applied during construction and after the development is completed. Policy 3.11 (Efficient Use of Land) seeks to ensure that developments make an efficient use of land as a key requirement of the sustainable use of land, whilst protecting amenity, responding positively to context, avoids compromising development potential of adjoining sites, making adequate provision for access, circulation and servicing, and matching development to availability of infrastructure. Policy 3.12 (Quality in design) requires new development to achieve a high quality of architectural and urban design. Policy 3.13 (Urban Design) advises that principles of good design must be taken into account in all developments. Policy 3.18 (Setting of Listed Buildings Conservation Areas and World Heritage Sites) advises that permission will not be granted for developments that would not preserve or enhance the immediate views and/or wider settings of a listed building, conservation area or world heritage site. 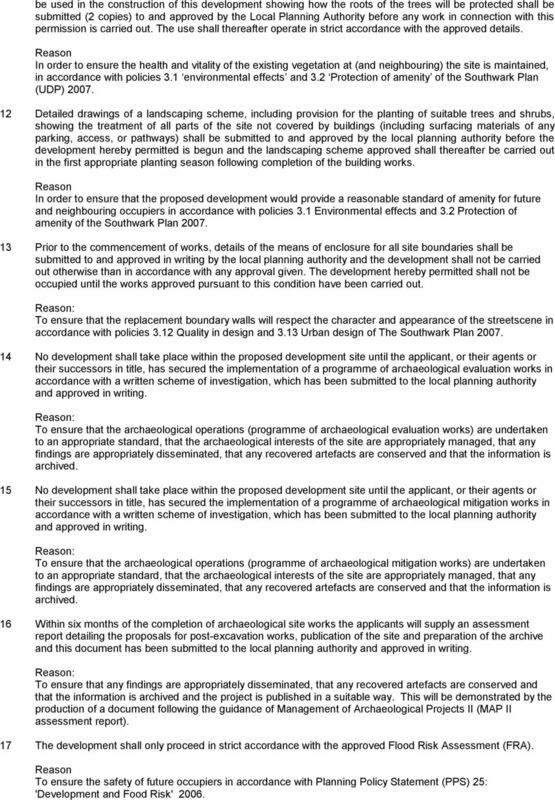 Policy 3.19 (Archaeology) advises that planning applications within Archaeological Priority Zones (APZ) should be accompanied by an archaeological assessment and evaluation of the site, including the impact of the proposed development. 5 Policy 4.1 (Density of residential development) states that residential development will be expected to comply with a range of density criteria taking into account the quality and impact of any non residential uses, and in relation to efficient use of land, having regard to factors such as location and public transport accessibility levels, facilitating a continuous supply of housing in London, but subject to high quality housing being provided and balanced against the need for other uses which also contribute to the quality of life. Policy 4.2 (Quality of residential accommodation) states that planning permission will be granted for residential accommodation provided that they achieve good quality living conditions; and include high standards of accessibility, including seeking to ensure that all new housing is built to Lifetime Homes Standards; privacy and outlook; natural sunlight and daylight; ventilation; space including suitable outdoor/green space; safety and security; protection from pollution, including noise and light pollution. Policy 5.2 (Transport Impacts) states that permission will not be granted for development which has an adverse impact on transport networks through significant increases in traffic or pollution and consideration has been given to impacts on the Transport for London road network as well as adequate provision for servicing, circulation and access to and from the site. 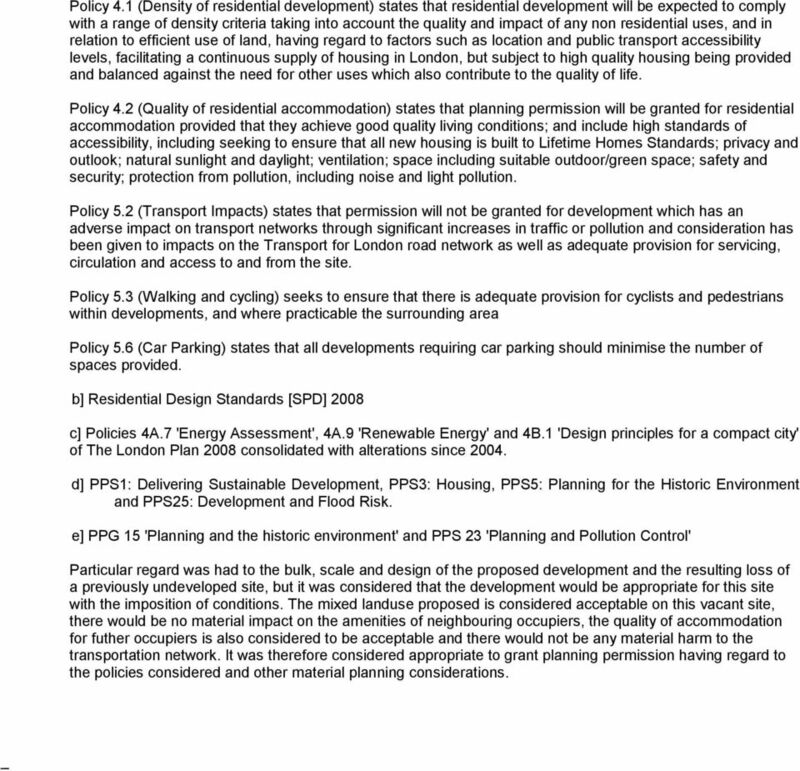 Policy 5.3 (Walking and cycling) seeks to ensure that there is adequate provision for cyclists and pedestrians within developments, and where practicable the surrounding area Policy 5.6 (Car Parking) states that all developments requiring car parking should minimise the number of spaces provided. b] Residential Design Standards [SPD] 2008 c] Policies 4A.7 'Energy Assessment', 4A.9 'Renewable Energy' and 4B.1 'Design principles for a compact city' of The London Plan 2008 consolidated with alterations since d] PPS1: Delivering Sustainable Development, PPS3: Housing, PPS5: Planning for the Historic Environment and PPS25: Development and Flood Risk. e] PPG 15 'Planning and the historic environment' and PPS 23 'Planning and Pollution Control' Particular regard was had to the bulk, scale and design of the proposed development and the resulting loss of a previously undeveloped site, but it was considered that the development would be appropriate for this site with the imposition of conditions. The mixed landuse proposed is considered acceptable on this vacant site, there would be no material impact on the amenities of neighbouring occupiers, the quality of accommodation for futher occupiers is also considered to be acceptable and there would not be any material harm to the transportation network. It was therefore considered appropriate to grant planning permission having regard to the policies considered and other material planning considerations. CITY OF WESTMINSTER. Date. PLANNING APPLICATIONS COMMITTEE Report of Director of Planning. Classification For General Release. REFERENCE: B/00605/13 Received: 11 February 2013 Accepted: 19 February 2013 WARD(S): High Barnet Expiry: 16 April 2013. 4. Recognise the land use and functional requirements of the adjoining local centre on the corner of South Terrace and Wray Avenue. Residential standards Supplementary planning document local development framework Adopted August 2006 CONTENTS 1. INTRODUCTION... 4 2. IMPORTANCE OF GOOD DESIGN IN NEW RESIDENTIAL DEVELOPMENT... 5 2.1.